Poopsie Surprise is in quite a big box, there are four unicorns to collect and you don't know which one you will get until you actually open up the box. 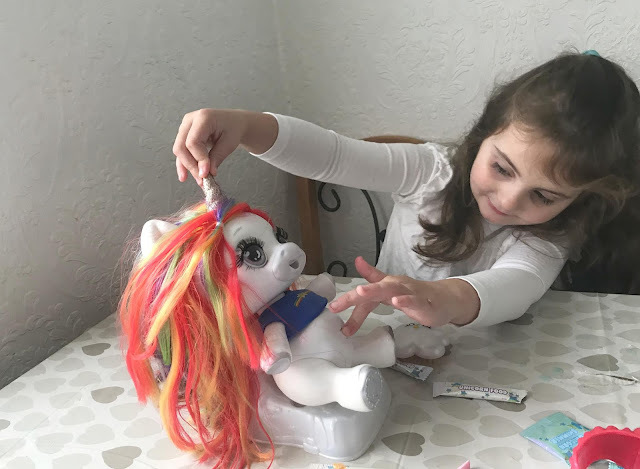 We received Rainbow Brightstar which is a unicorn with bright rainbow coloured hair and luckily the one my daughter really wanted to receive. When you open the Poopsie Surprise it is a bit like open a blind bag as when you open the wrapper lots of little blind bags are revealed. Inside the blind bags are accessories for the unicorn such as clothes, hairbrush, unicorn food and feeding equipment. Once you have unwrapped the box and found all the blind bags you can then open the case to see which unicorn you have received. We had Rainbow Brightstar but there was also Oopsie Starlight, Whoopsie Doodle and Dazzle Darling to collect. 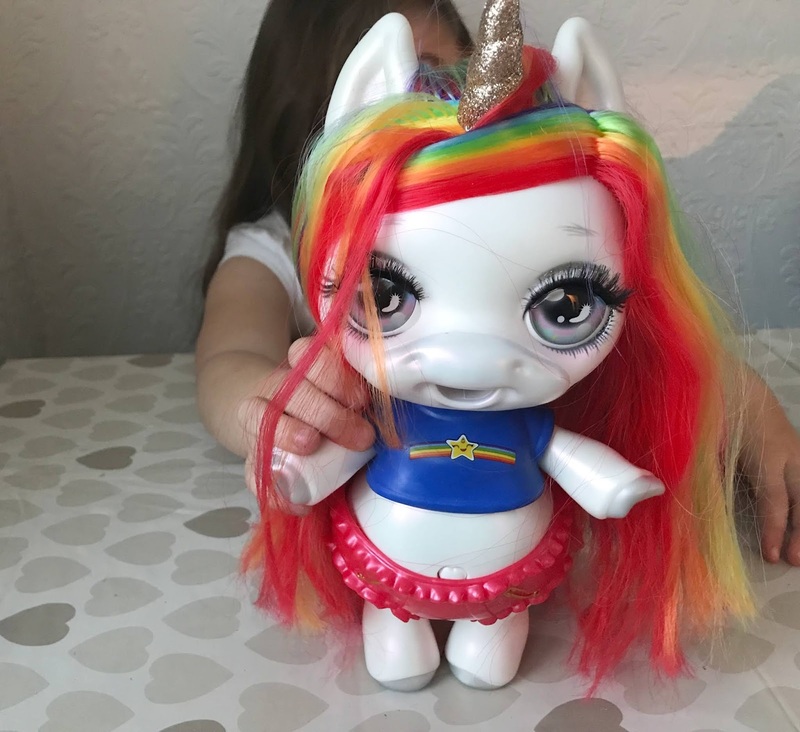 The unicorn is hard-bodied and has long, soft flowing hair and a golden unicorn horn, she has big eyes with long glittery eyelashes and Sophia loved her on sight. The outfit she came with was made of plastic but was easy to fit on the unicorn, it was a blue t-shirt with a rainbow on and a red frilly diaper. When we first opened the box and realised there were lots of different slime making bags and noticed there were lots of steps to make slime on the instructions I admit I was dreading getting started making the slime. Before you start I really do recommend reading the instructions properly as we didn't and the first attempt was a bit of a disaster and very messy. You need to make sure the dial on the unicorn is turned to feeding then you can start to feed the unicorn the ingredients to make slime. There is a clever little feeding spoon included which makes this a lot less messy then I imagined and Sophia really enjoyed feeding the unicorn the ingredients. 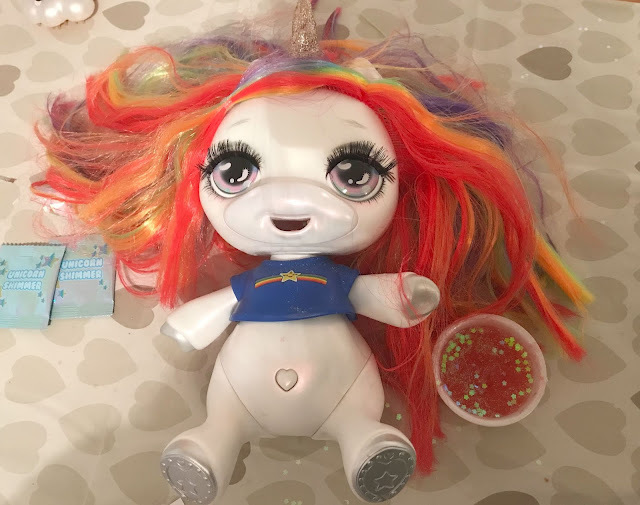 After you have fed the unicorn the ingredients and give her water you then need to cartwheel her (to mix all the slime together) before sitting her on the potty and pressing her heart belly button to make her poop slime. We tried making slime twice and each time this stage was very messy as the slime mixture was just leaking out of the unicorn when we cartwheeled her. I am not sure if we were doing something wrong but we couldn't find a way to stop it leaking everywhere. When you put Poosie Surprise on the potty she will poop slime but you have to wait 15-20 minutes for this to set. It took a bit longer for our slime to set properly so maybe we had added too much water. Once the slime is set you can put it inside the rainbow cloud keychain that is provided and your child can carry the slime around with them. 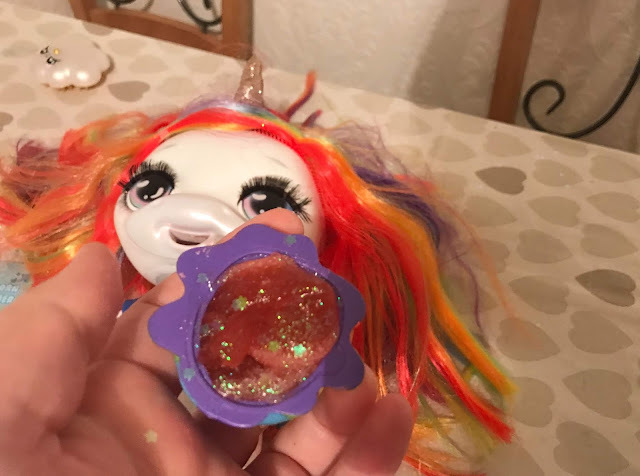 Honestly, I was a bit disappointed with this toy, the Unicorn is lovely and the idea behind it is great but for £50 I think you should get more slime making sachets as you only get enough to make four batches. The batches that you get are really small too so it would be nice to get a few more slime making sets. You can buy extra slime making kits which cost £10 and which I would recommend buying if you do get this toy for a Christmas gift. I found the whole slime-making process quite messy too as the unicorn kept leaking everywhere, however, we did make perfect slime by making it in the pot instead of in the unicorn. Sophia loved the Poopsise Surprise, the whole opening it and discovering the blind bags and which unicorn she has was super exciting for her. 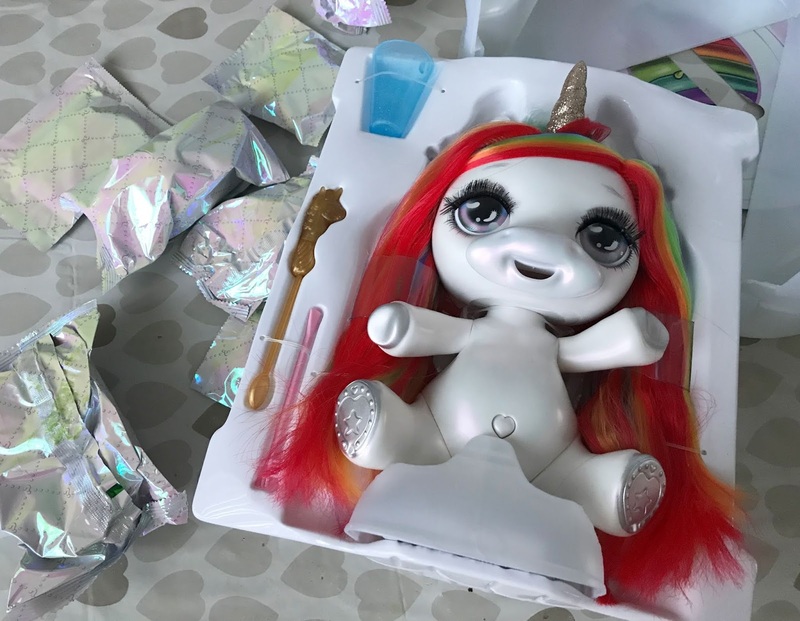 She enjoyed making the slime and feeding the unicorn and the mess didn't bother her at all as she was just happy to be making slime. She also really liked that she could store the slime she had made in her keychain. She also really likes just playing with the unicorn on its own without making slime, she carries it around like a baby and plays games with it. I think that the Poopsie Surprise Unicorn is a good idea and I can see why they will be so appealing to children. I liked the surprise element to them, not knowing which unicorn you would get and all of the blind bag surprises that we were not expecting. The unicorn itself is lovely and I like that children can play with it on its own. However, I find the whole slime making element really complicated and I can imagine it frustrating lots of people on Christmas morning with impatient children. It was a bit messy and the amount of slime it produces is fairly small, but my daughter really enjoyed making the slime. If your child gets this toy I am sure they will enjoy playing with it as much as my daughter has, just make sure you read the instructions fully before use and buy extra slime making kits. 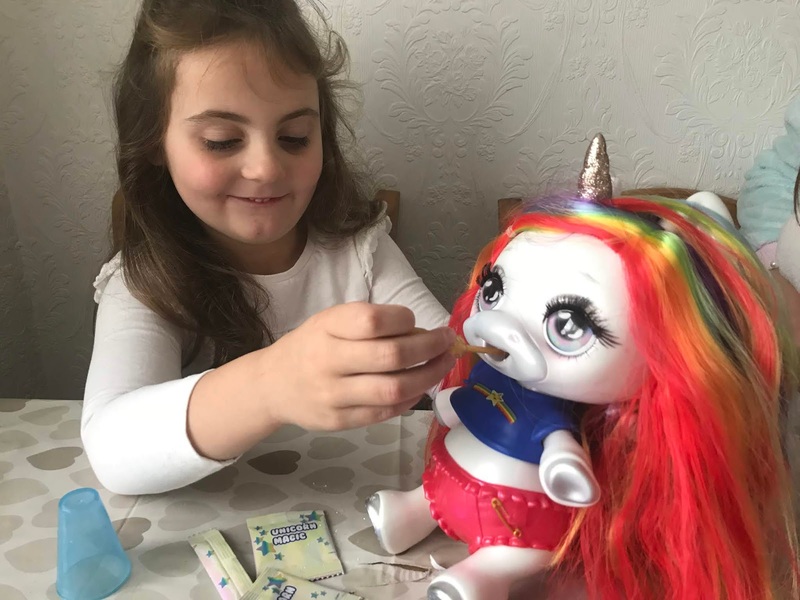 Poopsie Surprise Unicorn is available to buy from leading toy retailers like Smyths, Argos and Amazon priced at £49.99. Disclosure I was sent this toy for the purpose of this review, however, all opinions are my own. Oh my goodness, this is the kind of toy that T will love. She loves unicorns and slime, that's a perfect combination! But I agree though, for the price, you'd think they'd include more slime! My niece would love this, it's so colourful and cute. Like the idea of making slime too! My little girl would love this! Unicorns and slime - her favourite things (not mine!). Thankfully my girls have avoided slime so far! Holly loves unicorns and I'm sure if she saw this, she would love it. I agree it does seem a bit expensive for what you get. My daughter has one of these and absolutely loves it! I agree that the slime making bit is quite fiddley and something I basically did myself as there were too many steps for Evelyn to follow. 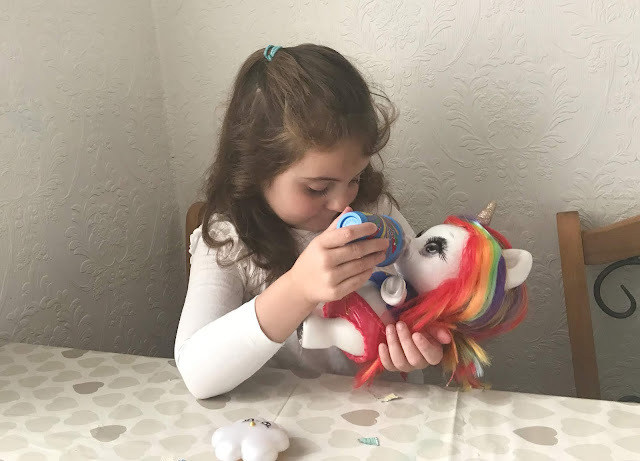 Saying that though she absolutely adores the Poopsie unicorn and we love her long hair and glittery eyes! A unicorn with a potty! Hilarious! I know my daughter would LOVE this.